How to Change PDF Page Size? PDF is print-oriented format with a static layout and that is why it has been widely adopted in business life. However, you may have met such problems that your PDF document should be resized as the page size is larger than the paper size. But how? Don't worry. You will find the way to resolve your problem on this page. First, let's talk something about the Page Size Series. There are two page size series widely adopted in the world. The first one is ISO Paper Sizes. The Series A is used for Standard Printing and Stationery. The Series B is used for Posters, Wall-Charts etc. The United States, Canada, and in part Mexico adopted the second Page Size Series and they are today the only industrialized nations in which the ISO standard paper sizes are not yet widely used. 2. How to Resize PDF? As we know from the above introduction, different countries adpot different page size series. We will introduce some tools to change page size. PDFMate Free PDF Converter is a multi-function converter. The powerful program provides options to resize PDF documents. Add a PDF file to the free converter, choose PDF as the output format, select a page size option and then click "Convert" button. The program will create a new resized PDF document. Strengths: Easy to operate; Converts to many other formats not just PDF; a desktop-based free converter. Weaknesses: Only three page size options are in the list and the US page size options are not available. Neevia Technology provides free online service to change PDF page size. It provides perhaps the widest size options for users. 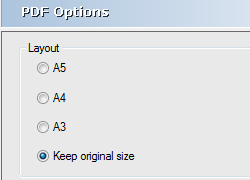 Choose the page size and page orientation and then upload your PDF document. It is quite straightforward. provides additional service to change page orientation. Weaknesses: There is a size limit for the upload PDF: 5MB. DoPDF Free PDF Converter is a printer-based freeware. It can convert documents to searchable PDF files with the options to modify the paper size, modify the resolution, change page orientation. The program provides commonly used size options which will be very convenient for users to print the file on paper with particular size. Strengths: Flexible options to change page size and page orientation for printing; easy to use. Weaknesses: It takes some time after the printing process is over for the converted file to come up and the page size options are only available when printing the file. 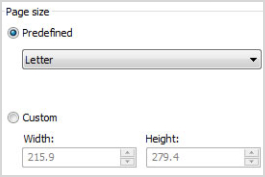 There are some other programs, such as Nitro Pro.8 and PDF Converter Elite, have the features to resize PDF page size but neither of them is free. For people who are looking for a program to resize pdf, the above three tools can play their roles.